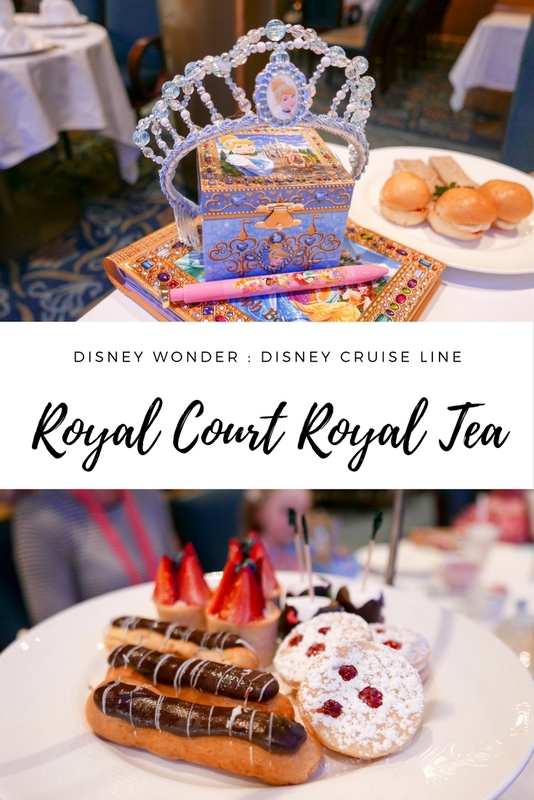 Royal Court Royal Tea: Disney Wonder, Disney Cruise Line - Adventure, baby! 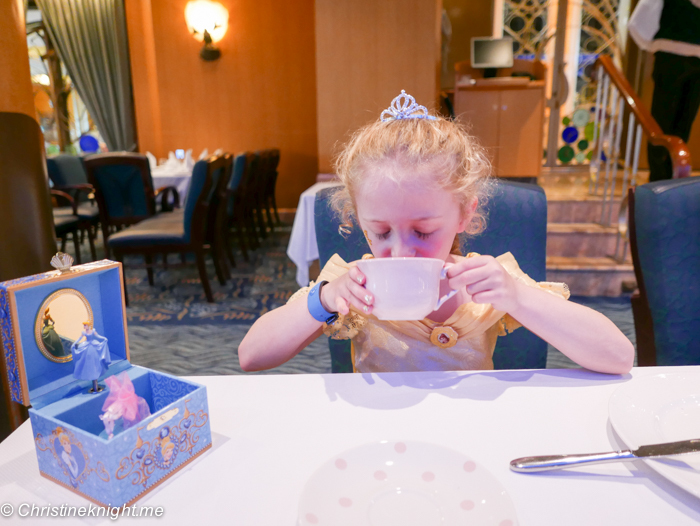 For little girls who dream of princesses, there is no experience more magical than the Royal Court Royal Tea aboard the Disney Cruise Line fleet. 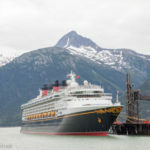 The tea is available on all four ships – we experienced our tea aboard the Disney Wonder on our 7-night Alaska cruise. 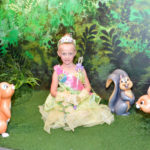 During Royal Court Royal Tea, children are crowned young princesses or dubbed royal knights, in a special celebration that is full of songs, gifts, food and royal guests. 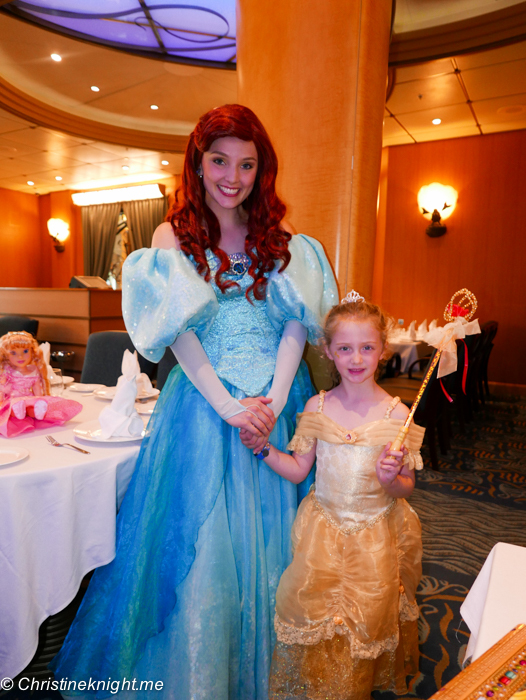 It’s a truly special experience that is unforgettable for kids and their parents alike. 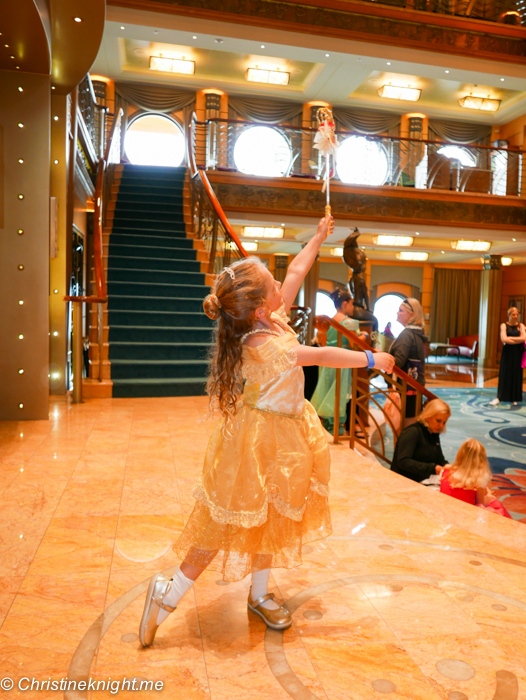 The Royal Court Royal Tea is offered just once during the cruises to a small group, making it an intimate setting. 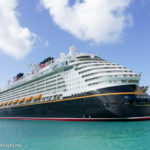 We tried to book the tea last year on our Caribbean cruise and weren’t able to secure spots. 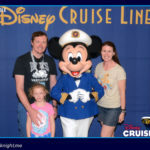 This year on the Wonder I was a silver Castaway Club member thanks to my previous sailing, so was able to book it with my early booking window. 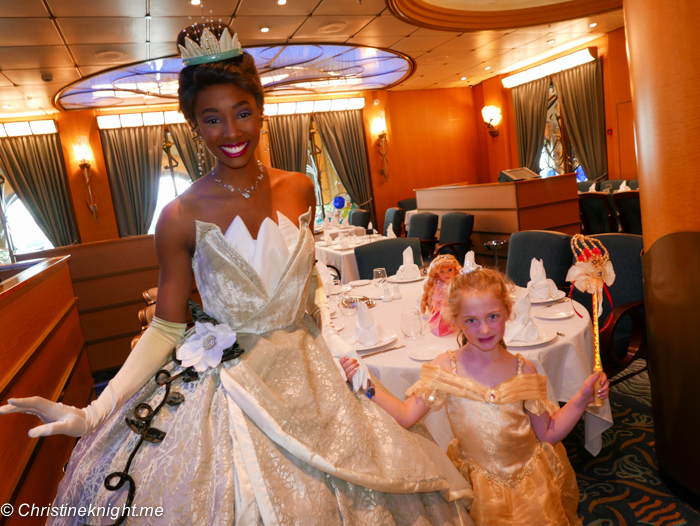 When we boarded the Disney Wonder, a special invitation was waiting for us on our bed, with the request to call and let the staff know which princess we would like on our specially designed cupcake. 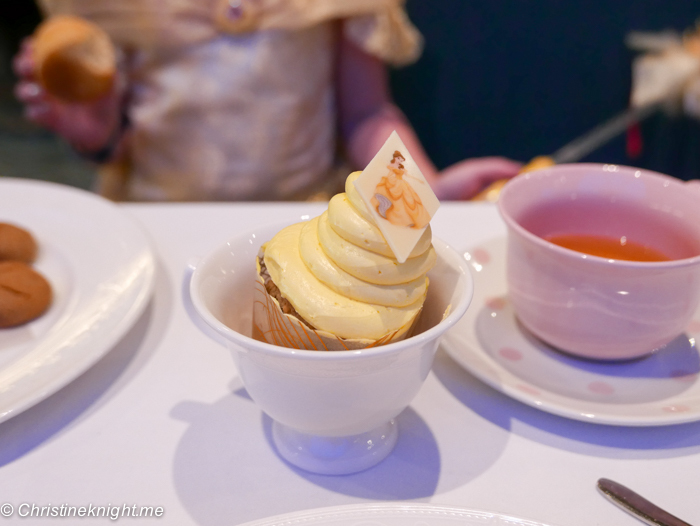 Belle is the favourite in our family, so a Belle cupcake was requested. 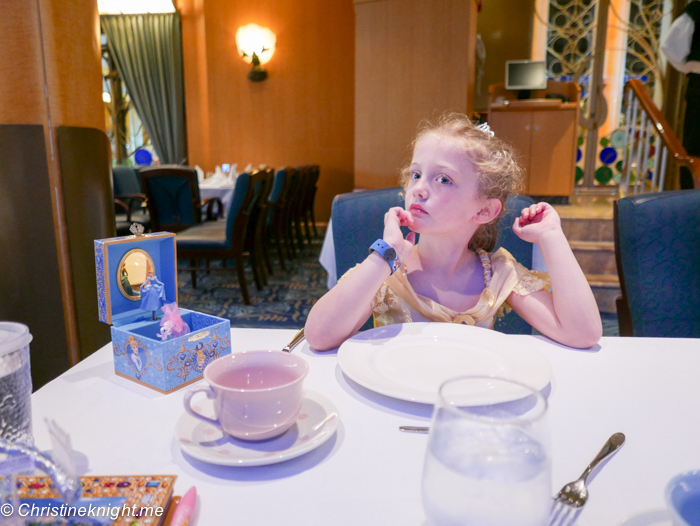 Our tea took place at 3pm in Triton’s, the main dining room on the ship. 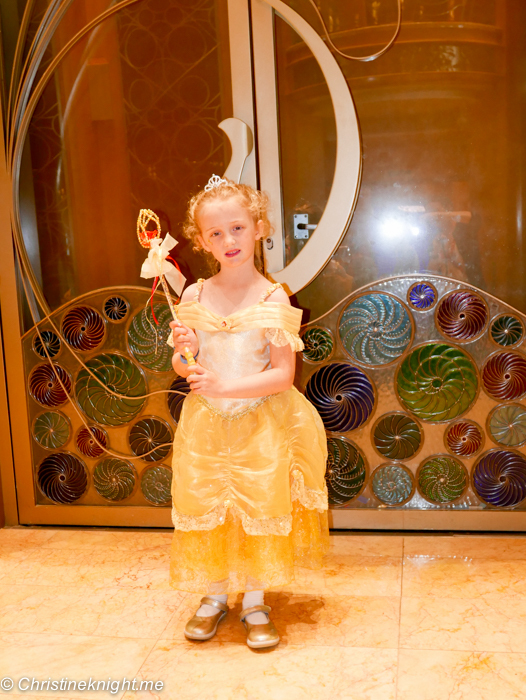 We joined the other guests outside and checked in with the cast members who were from the Bibbidi Bobbidi Boutique that we had visited the previous day. 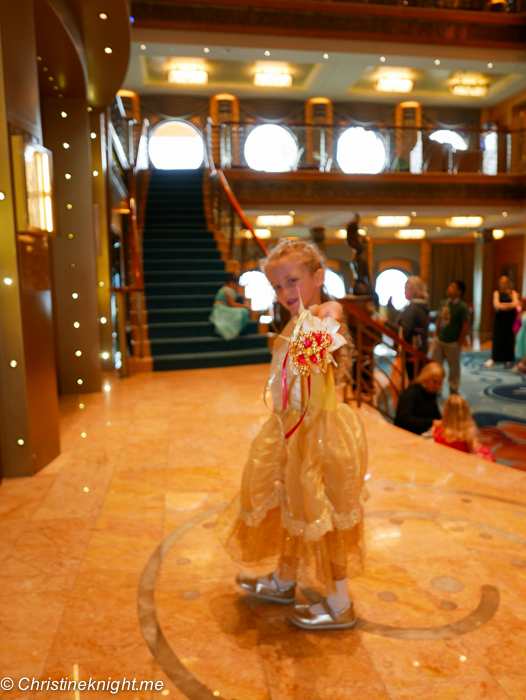 Many girls visited the same day as the tea so had perfectly coiffed princess hair. 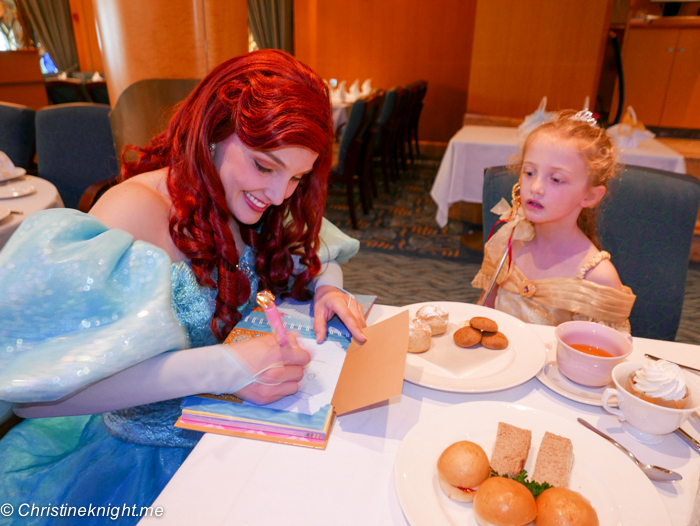 At 3pm, the Royal Tea experience began with a royal greeting from Lady Chamomile, the host of the event. 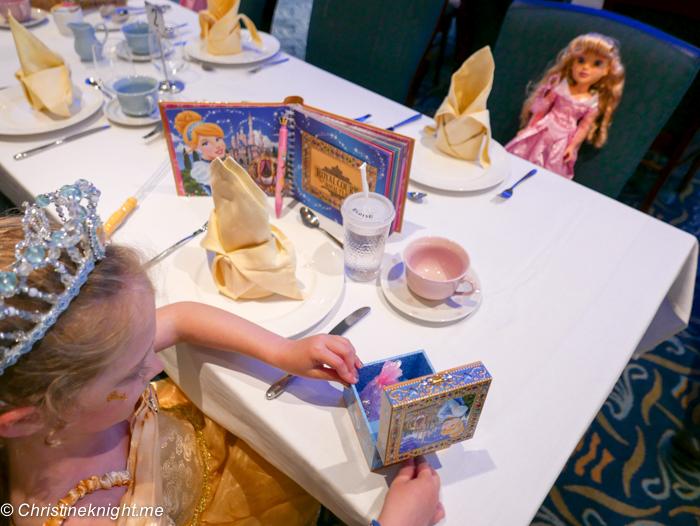 Each child was escorted by a Royal Page into the dining room, with a special individual announcement and crowning (or knighting) before being taken to their dining spot at the tables. 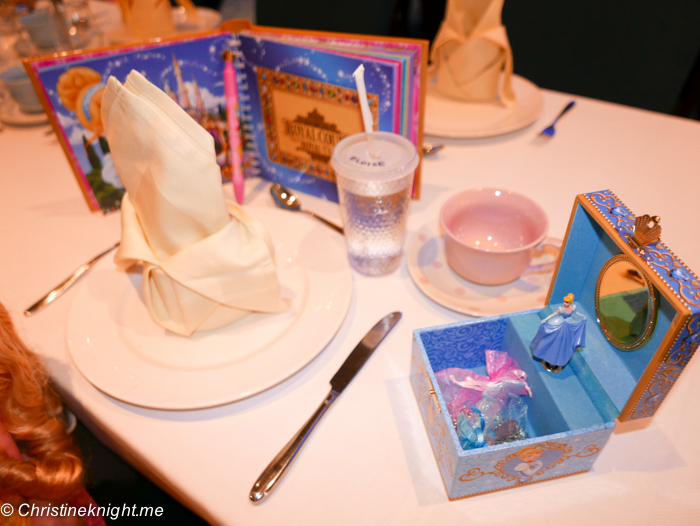 Each dining spot was filled with beautiful gifts for the kids. 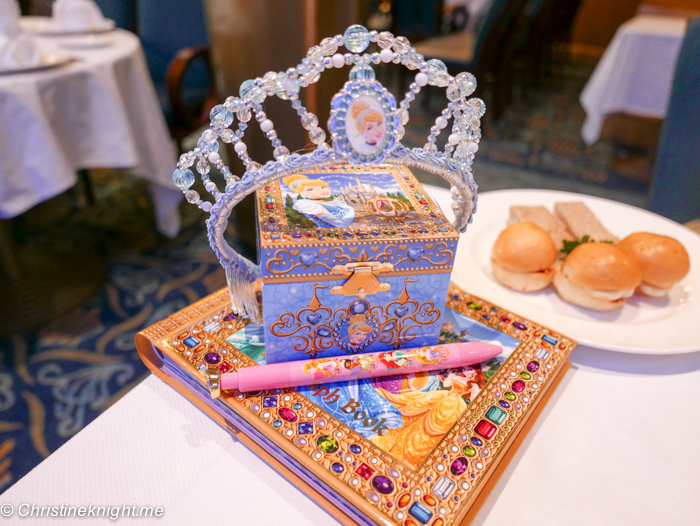 A large Aurora doll, Cinderella jewellery box with a charm bracelet and necklace, large autograph book and fancy princess pen was ready for each “princess”. 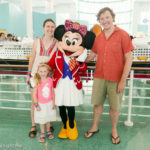 Lady Chamomile was joined by Chef Brule, and the two entertained the kids throughout the tea with singing and stories. 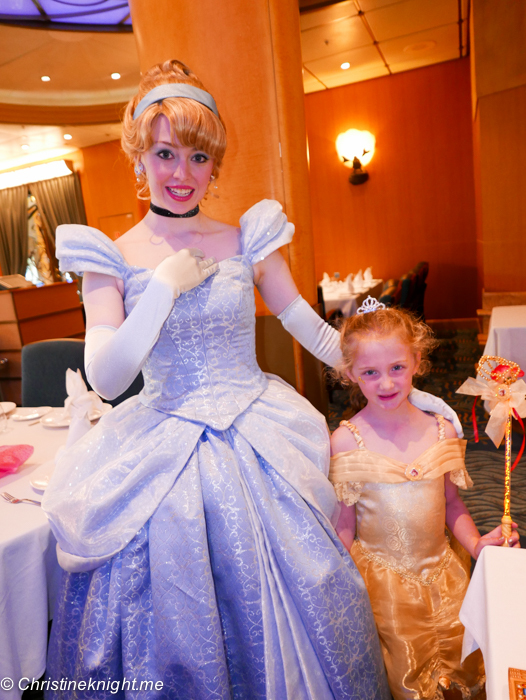 The pair were immensely fun and had excellent singing voices. 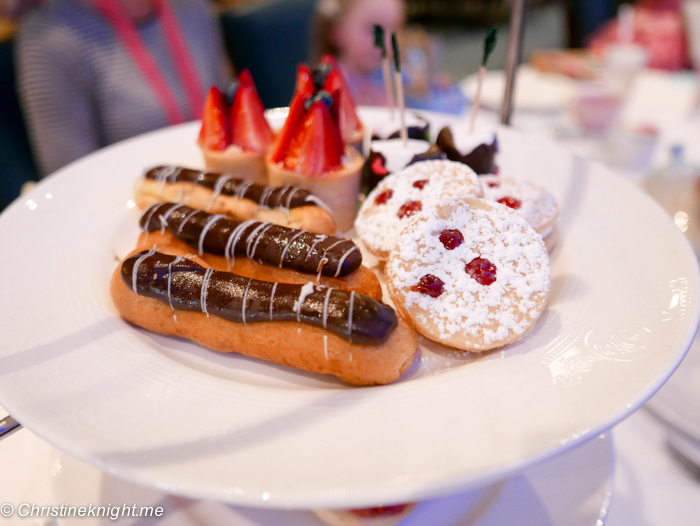 Tea was served to all guests – apple juice to the kids, real tea for the adults, and tiered platters of sweets and sandwiches. 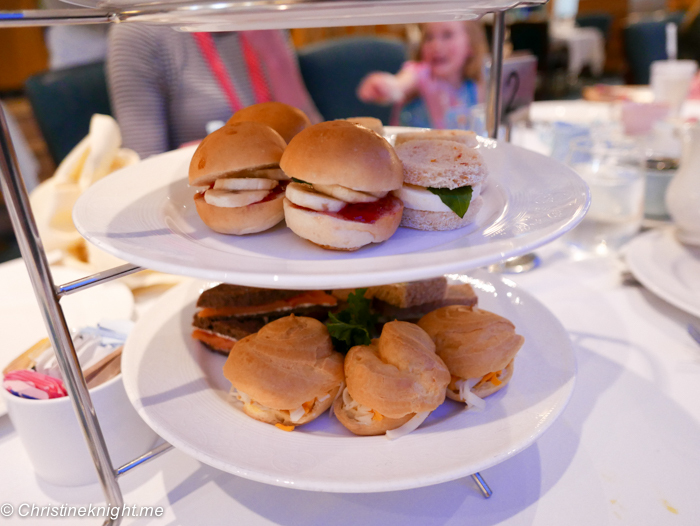 We had a lot of mix ups with the food after letting them know we were vegetarian, but really there was no need for any trouble over the food – with the exception of one sandwich (which had salmon), the entire tea was vegetarian. 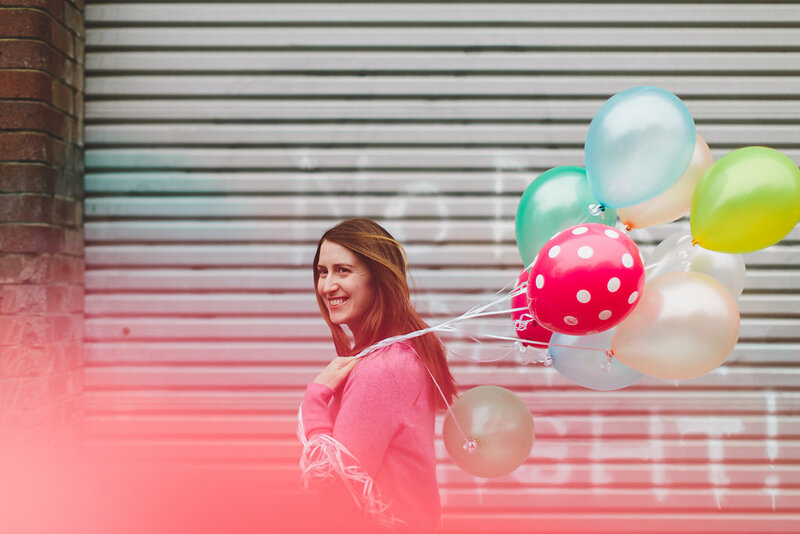 The staff did their best to cater to all dietary requirements, including vegan and allergy-friendly options which were given to us by mistake, but which were happily received by other vegan diners. 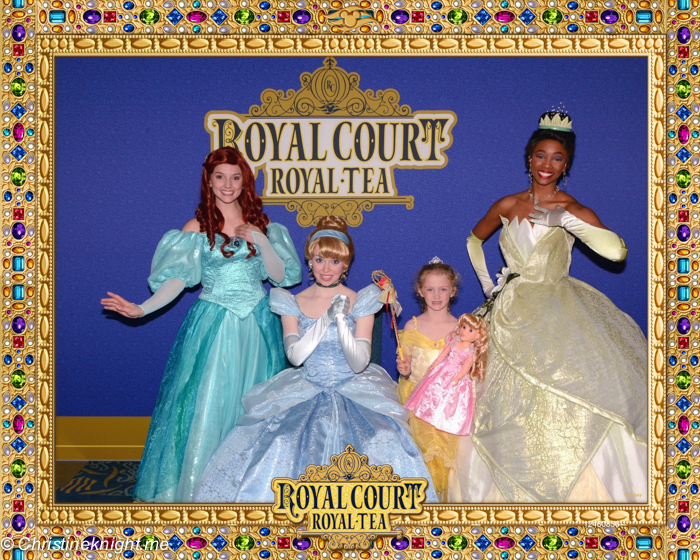 During the tea, three princesses joined us for the celebration – Cinderella, Ariel and Tiana. 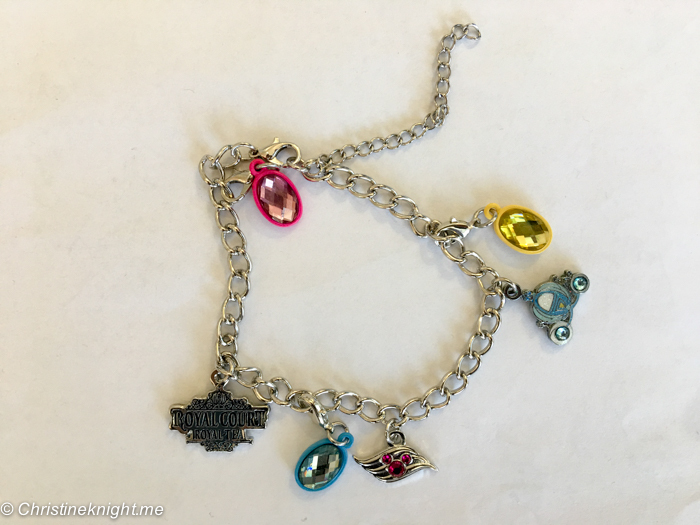 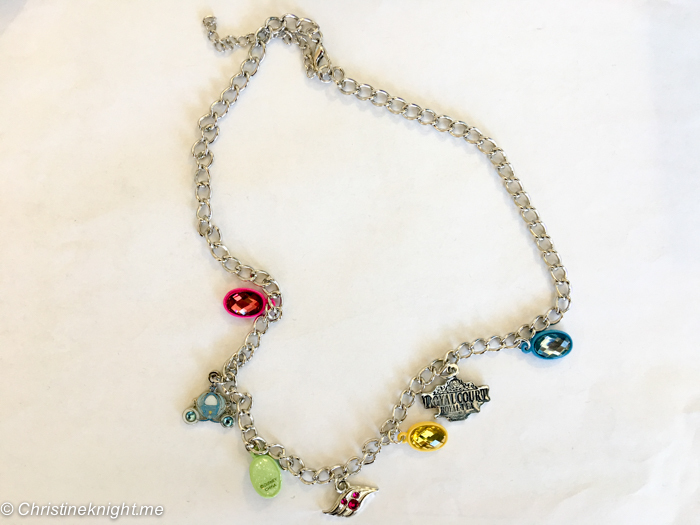 Each princess made their way around the room, spending quite a lot of time with each child for autographs and photos, and leaving them with an additional charm for their bracelets. 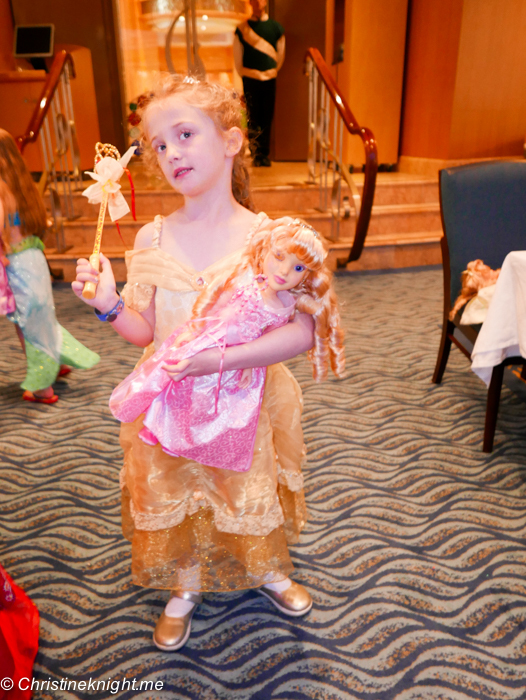 The children had a magical experience at the tea – so much special pampering and entertainment made this tea party an incredible highlight for the cruise. 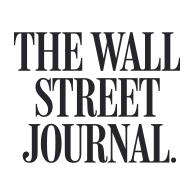 A few days after the tea party we receive a luxe folio with the photo taken from the tea inside as a special take-home gift. 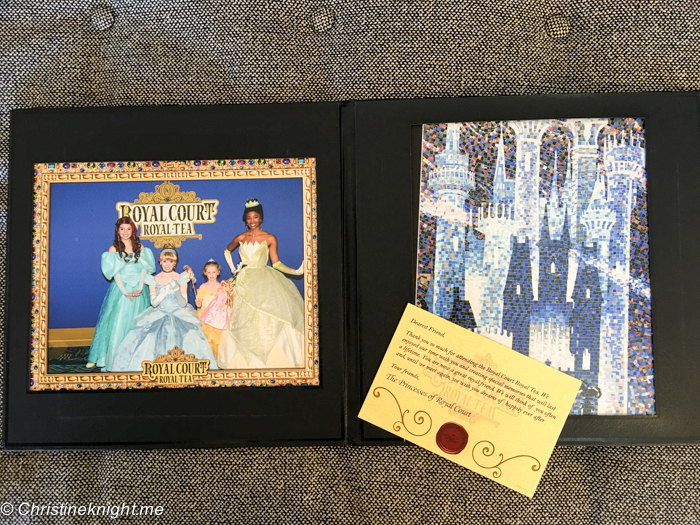 It was a very thoughtful way to end the royal experience. 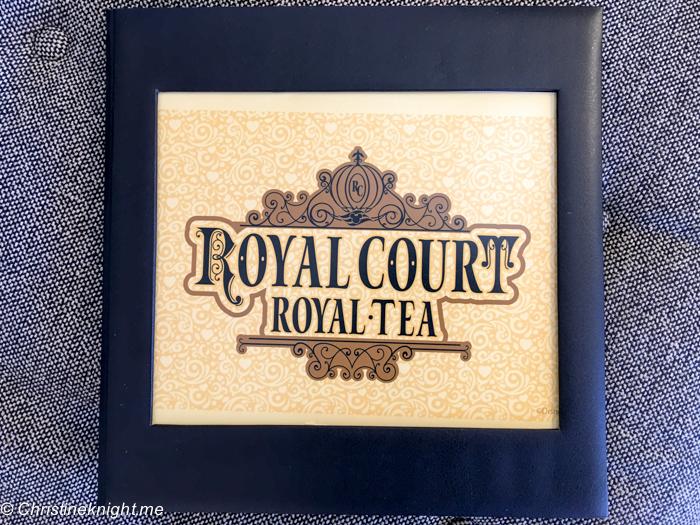 More information on the Royal Court Royal Tea.